The tools you use in the kitchen are just that: tools. While I’m certainly guilty of playing up the effect of a nice knife or frying pan from time to time, it’s not too much different from what happens when you purchase a nice hammer or vacuum cleaner. Your chores will become more fun for a time while you learn the quirks of your new device. After that brief honeymoon period, however, you’ll go back to hammering or vacuuming with your usual old attitude. In other words, going out of your way to splurge on an expensive cookware set won’t magically make your food better. Sure, it’ll be fun for a time and you’ll impress your dinner guests, but the food you cook will be pretty similar and your long-term attitude towards cooking and food prep probably won’t change. There’s an exception to this. If you’ve got a low-quality tool that simply doesn’t do the job, upgrading to a more effective model will make things much more enjoyable. This can mean swapping out your dull knife for a sharp one, replacing your old non-stick pan with something that’s actually non-stick or upgrading your food processor to process food more quietly and quickly. 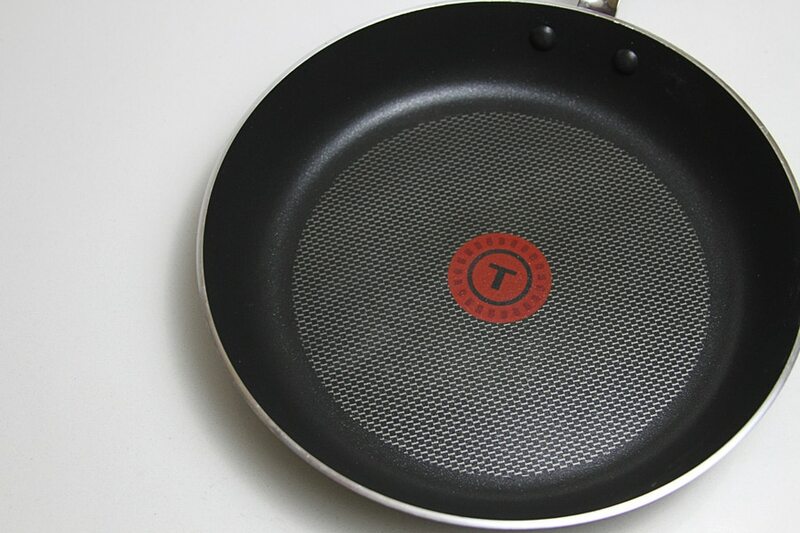 T-Fal and Farberware are brands that aren’t known for their super-high end products. Instead, they make products that are high-quality and affordable. This means that while both brands are nice upgrades over inadequate cookware, they’re not going to beat your Calphalon, All-Clad, or Cuisinart cookware. Instead, they’re an excellent budget option for people who prefer to think of their cookware as inexpensive tools. Farberware is an old-school company. They’ve been making cookware since they were founded in New York in 1900. Despite this long legacy, Farberware has become a solid discount brand instead of a luxury brand (like JA Henckels). This stainless steel cookware set shows that Farberware knows what it’s doing when it comes to cookware. The set is fairly unique in that it comes with stainless pots and non-stick pans. For me, this is a nice change from the normal formula, since I’m not super concerned with having a non-stick coating in the pan I used for pasta or rice. Instead, the durable stainless steel cooking surface will last me for years without chipping or flaking. Like most modern cookware, this set is made from a mix of 18/10 stainless and aluminum. The aluminum keeps the cookware light and helps transfer heat throughout each pot and pan evenly, while the steel provides a safe, durable cooking surface and a scratch resistant, easy to clean outer layer. This cookware set is oven safe to 350 and ostensibly dishwasher safe, although you’re probably best off hand washing it when you can. The low oven safety is likely due to the porcelain enamel on the handles and lids, which is somewhat stylish and fairly comfortable. As far as looks go, this set is fairly unique. Not only are the lids and handles made with a hard enamel (instead of rubberized plastic), the lids themselves have a bit of a curved Hershey’s-kiss shape. This won’t have any impact on cooking performance, but it does make this set look very unique. It’s certainly an interesting way to set your kitchen apart. How does it perform? Excellently. Like most modern stainless steel cookware sets, there aren’t any obvious flaws with the way this cookware handles on the stove. It heats quickly, heats evenly, and seems strong and well constructed. Overall, this Farberware cookware set is a pretty solid choice for anyone who’s looking for an unusual traditional aesthetic. It looks just unique enough to set your kitchen apart while still being conservative enough to match any silverware or decor. More importantly, however, you get non-stick frying pans (for eggs and meat) and non-stick pots. This keeps your costs down since you won’t have to replace this whole set when the non-stick wears off. If you want a large, inexpensive cookware set, the Farberware Classic is a great choice. Before I get too into things, it’s worth noting that T-Fal makes pretty much every major style of cookware. You can find multi-ply stainless, ceramic non-stick, and PTFE non-stick cooking surfaces in T-Fal sets. While this is one of the more popular (and better) sets made by T-Fal, you’re free to choose a different set if you’d prefer a different cooking surface. Personally, my biggest beef with this cookware set is the thermo-spot. I have a lot of trouble using this supposedly helpful feature to tell me anything. It’s supposed to change color as your pan heats up to let you know it’s pre-heated. Unfortunately, it can be a bit hard to see with food on it, and the color change isn’t quite as obvious as I would like. Otherwise, however, this set is great. The anodized aluminum offers pretty much the same set of benefits as the multi-ply set above. A core of aluminum provides incredible heat transfer while keeping things light and cheap. 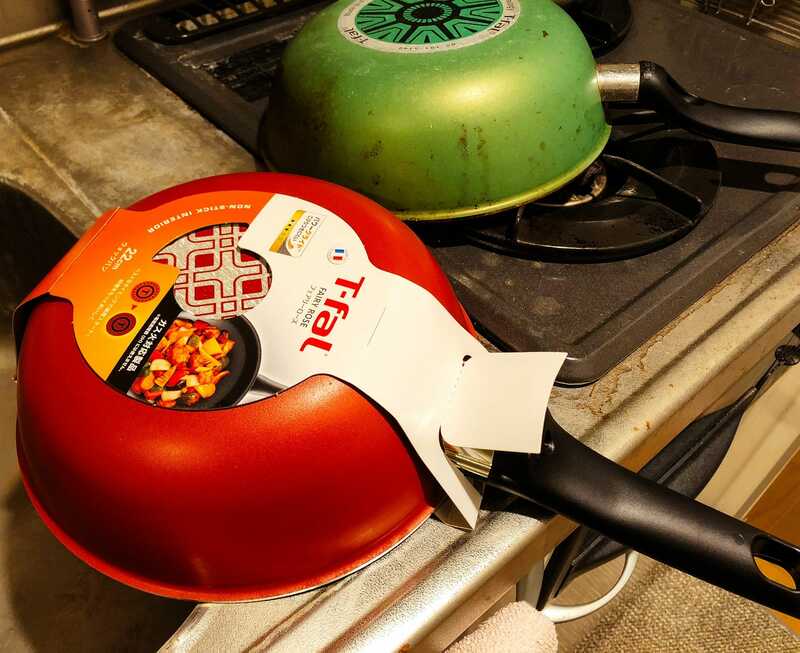 The only difference here is that instead of using a steel outer layer, this T-Fal set uses a layer of extra hard chemically treated aluminum. It’s totally safe and almost as non-reactive as stainless steel. I’m a big fan of the non-stick used with this cookware set. The lack of any PFOA means that I don’t have to be worried about any toxic chemicals, and the coating seems incredibly effective at letting eggs and chicken breasts and other sticky foods slide around with no fat at all. Like all non-stick coatings, however, it will eventually wear off, leaving you with a pan that you probably don’t want to cook out of. You can expect this process to take between 2 and 5 years, depending on how you care for your pans. In other words, don’t purchase this set if you can’t afford to replace it in 5 years or so. 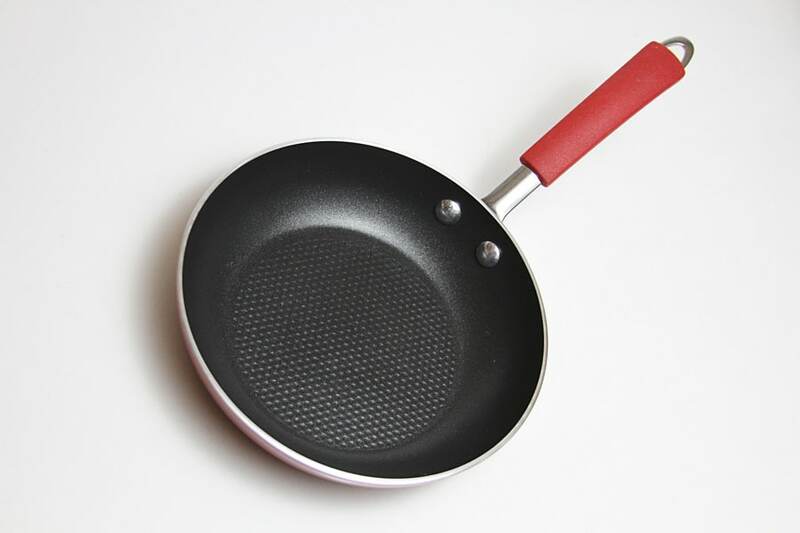 The cooking surface on these pots and pans is covered with a special grid of non-stick material that’s designed to thwart the negative effects of metal utensils on Teflon. It’s somewhat effective at reducing the chances you’ll accidentally scratch your pots and pans with a fork. That said, you can definitely scratch this cookware if you try hard enough. This set comes with well fitting glass lids that have handy steam vents for less rattle and mess. The contents of the set include a steamer insert (one of my favorite pieces of cookware) and a tiny one-egg pan for easy breakfasts. 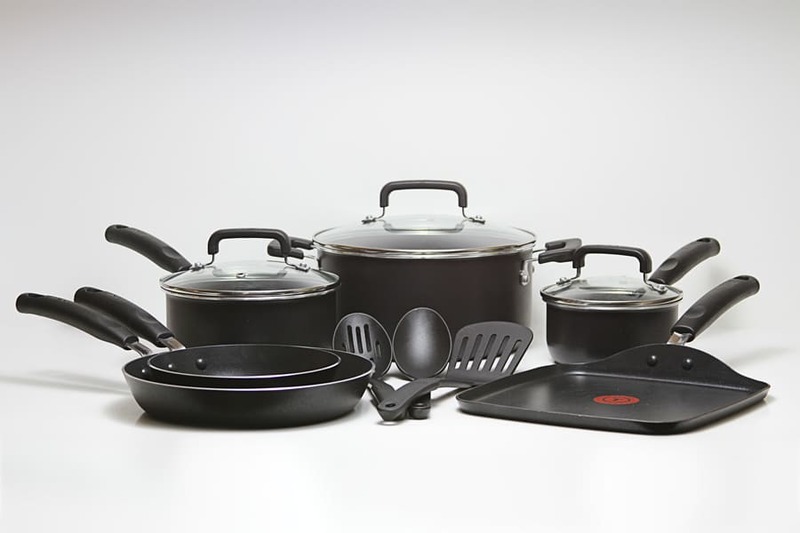 If you’d like a cookware set with a more modern appearance or you’d like a totally non-stick cookware set, this T-Fal hard anodized cookware set is a perfect choice. It’s got excellent performance at a very low cost, meaning it’ll give you great results without breaking your budget. How Do Farberware Pans and T-Fal Pots Compare To Other Brands? 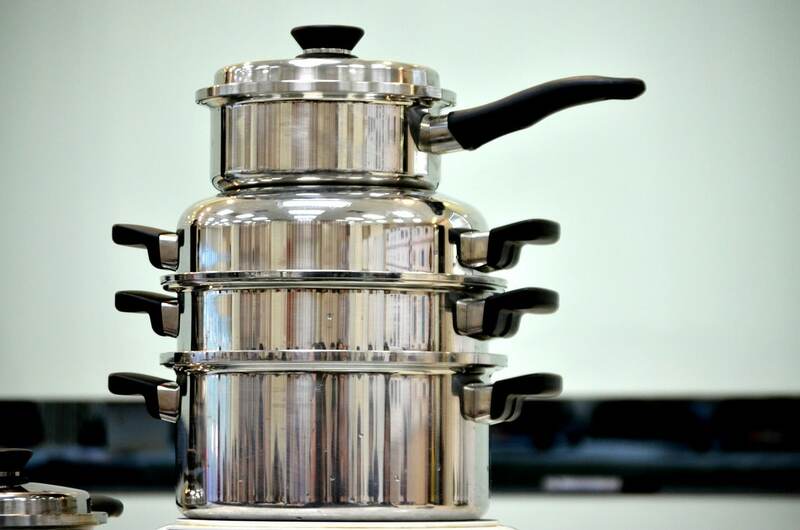 When you shop for cookware, you should spend a decent amount of time looking at the core, vital features of each pot or pan. This includes the size, shape, materials, and ease-of-use features that each piece of cookware comes with. In recent years, however, companies have branched out to copy each other’s signature methods of making cookware. This means that there’s not a lot of brand identity left. Sure, you’ve got a few rare brands like All-Clad that have some discernable difference. Otherwise, however, there’s not a lot that separates many of the top cookware manufacturers from each other. Several of them are even owned by the same parent company, meaning that the brands you think are “competing” are actually working together to help each other sell pots and pans. The point of this aside is to give my opinion that Farberware and T-Fal are both excellent, serviceable brands. Both my own personal experience and user reports indicate that both brands provide very good customer service. They both also somehow manage to make very inexpensive cookware, despite the fact that each piece is pretty high quality. Will your Farberware set impress your guests as much as an All-Clad set? Probably not. As far as cooking is concerned, however, both of these brands will hold their own against the very best brands in the market. They’ll even beat made-for-TV brands like Gotham Steel and Red Copper clean. T-Fal or Farberware: The Best Choice For Cheap Cookware? I think that both Farberware and T-Fal are excellent options for anyone who wants inexpensive cookware that can get the job done. If you’re having trouble deciding between these two brands, try ignoring the brand names and only looking at product apperance, functionality, and cost. Even if you just decide between T-Fal and Farberware based on which brand has the steepest Amazon sale at the moment, you won’t regret your decision. Both brands make wonderful cookware which will fit right into your kitchen.